It’s Friday! (Okay fine it’s actually Saturday but let’s pretend, k?) I’m glad. It’s been a long week of heat, trying to get the motivation to pack, and trying to get work done amidst babies who don’t want to nap and the lovely four-month sleep regression (woof). This Friday’s favorites are brought to you by the new house. I’m looking forward to a fresh start, and while I was initially nervous about the amount of downsizing and simplifying we have to do, now I’m excited. I find it stressful to have clutter everywhere, and I feel like a smaller space is going to enable me to be much more intentional with my purchases. Plus y’all? We have way too much junk. I don’t even want to admit how much stuff we’ve already thrown away or set aside for donation and we’ve done, like three rooms and the barn. All I’ll say is that I was right to buy the box of fifty giant black trash bags. I’m so glad we have a dumpster because that sucker is full. Also my husband is a feed sack hoarder, judging by the dumpster’s current contents. I’m going for neutrals-with-a-ranchy/Mexican-twist. Like J. Crew and Joanna Gaines went on a vacation to a New Mexican ranchero. Also Dolly Parton came along because #bighairismyfave. Favorite frill: Frayed bathroom rug. Our current bathroom rug situation won’t work in the new house, and I love these! Pretty, but not so girly that Bert will notice them, and grey, but the detail makes them interesting. Plus it’s on sale. I may have to pull the trigger and order one! Favorite Hide-the-Junk Solution: Big Lidded Baskets. I’m getting two of these to go under the (seriously cool) console table a friend built for us. We’ve never used the table in this house–although I don’t know why–and I’m so excited that it will finally be in our house! But back to the baskets. I’m planning on using these for the boys’ toys. Since we don’t have a playroom in the new house like we do in our current one, I wanted a way for toys to be accessible but also easy to put away and hide. I’m planning an excursion to Home Goods soon to see what I can find that’s similar (but less expensive, let’s get real). Favorite Art Inspire: Bright Cow. I’ve needed something to go over our bed forever, and never pulled the trigger because nothing felt right. In the new house, I’d like to have a painting or drawing over the bed and this one is almost right. I’d love a painting of a longhorn but everything I’ve found has been too expensive or not quite my taste. We’ll see! We had a ranch party last night and our boss’ two daughters are both wildly talented artistically, so I’ve asked them both if I could commission some art from them, and I can’t wait! I think my longhorn dream may come true after all! Favorite Deck Inspire: G&C’s Light-Covered Porch. My greatest wish for the new house is that we can build on to the current deck so we have a place to entertain outside. My bones tell me that we’re moving to a good neighborhood (aka a good 50 square miles ha), and I’d love to have a big ole porch with comfy chairs and a bar cart for when we have guests over. Also, there are a lot of rattlesnakes where we’re headed, and it would be nice to have an additional worry-free play space for the boys since we use our deck a lot here. And the string lights have been a dream of mine for many a year now, so I think now is the time! Favorite Crib: Gulliver crib from Ikea. Bert has refused to break down and set up our current crib because it was a horrendous pain to deal with and it has an attached changing table that makes it awkward to fit in smaller spaces, so we’re just going to get a new one. I like the clean, basic simplicity of this crib from Ikea, and it doesn’t break the bank. It’s actually fairly similar to one from Land of Nod that’s like, $700. Favorite Pillows: I‘m thinking a combination of all three of these (first, second, third), and maybe something graphic thrown in? I know it’s a design “duh,” but I like pillows being the “pop of color” in a room because well, you can change it in a jiff aka for Christmas in November. Favorite Paint: Neutral. I’m boring when it comes to paint because every time I’ve tried to be exciting with a yellow or something I’ve hated it. I just have a bad eye for paint! But, our house right now is painted Revere Pewter and I love it. I’m not a fan of bright white, and the grey mellows everything out just enough. Now, the problem is that recently I’ve seen lots of Gray Owl and I love it, too. I don’t know which to pick! I showed my mom and she asked “Well, do you want one that’s more brown or one that’s more blue?” Yes. Favorite Can I Get Away With This? Is This Too Trendy? Does This Make Me Look Fat? : Peppercorn doors. Okay. I’m not that trendy, but sometimes things are trendy for a reason. 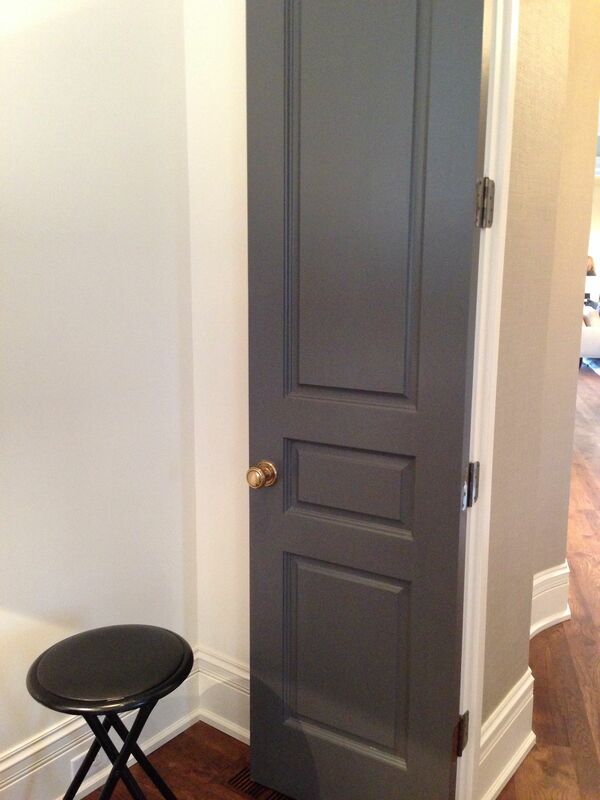 Like this new craze of painting interior doors. But I’ve always loved painted front doors, and our doors get so darn dirty with little boy hands and big boy cowboy boots that the idea of painting them a dark color is ever so appealing. Worth noting: Peppercorn is almost always paired with Gray Owl in Pinterestville and Instagramland. Food for thought. Favorite I’ve-Had-This-Pinned-For-Years-But-Never-Done-It: DIY Restoration Hardware shelves. I love the look of these shelves. They’re masculine, rustic, unfussy, and look relatively easy to build. I’m thinking maybe in the boys’/guest bath! Favorite Bathroom: Fixer-Uppery Little Bath. I just love this little bathroom. I don’t remember exactly what the bathrooms in the new house look like, but once we’ve lived there for awhile I’d love to try a take on this! It’s the weekend, I hope y’all are weekending! And that you have something lovely planned, even if that’s just a refreshing drink on your porch or a trip to some haven that has slushies. See you next week, and thank you for reading! I love it all! I so can’t wait to see how you make this place in a home.